This compact, practical hand-held gauge has been designed for non- destructive, fast and precise coating thickness measurement. on all non-ferrous metals such as aluminium, copper, brass, austenitic stainless steel. The gauge has especially been designed for use in the field of indus- trial corrosion prevention. Readings as well as statistical values can be documented with the portable MiniPrint data printer. For measurements in dark areas all models feature display backlight. The single pole probe is connected to the gauge by a 1 metre cable. The newly developed probe tip is made from very hard and wear resistant material which guarantees virtually unlimited life provided it is handled correctly. The dual FN probe automatically adjusts to the correct substrate metal: ferrous/non-ferrous. This feature is not available with the 600-B model. 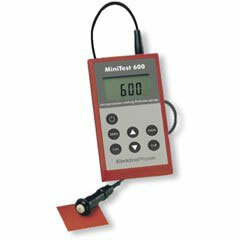 The gauges conform to DIN, ISO, BS, ASTM. Statistics: x-, standard deviation, n (max. 9.999), min., max.